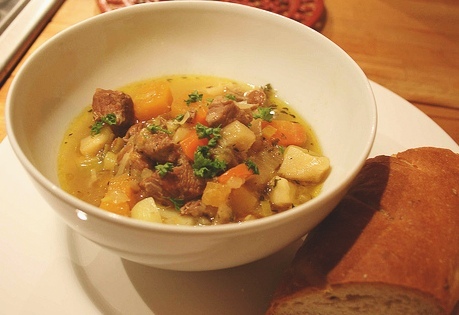 Cawl is a traditional Welsh stew-like dish consisting of meat and vegetables. Its ingredients tend to vary, but usually includes Welsh lamb and leeks. Cawl is translated as soup in modern day Welsh. Cawl has a good claim to be considered the national dish of Wales, and there are a large number of regional variations. It usually contains meat, normally cut into small pieces, and this may be lamb or mutton (with the fat trimmed if so wished, or the fat skimmed off the broth during cooking), beef, pork or bacon, the bacon sometimes being added as an accompaniment to another meat. The vegetables used also vary, though leeks are usually included, as are potatoes and carrots along with celery and onion and maybe parsnip or turnip. "Cawl cennin", or leek cawl, can be made without meat but using meat stock. In some areas cawl is often served with bread and cheese (the bread is usually half a baguette or a piece of French bread). These are served separately on a plate. The dish was traditionally cooked in an iron pot or cauldron over the fire. Normally cawl is eaten in a bowl as a one-course meal. In some parts of Wales however the broth from the cawl was eaten as a first course and the meat and vegetables eaten separately as a second course. Like all traditional country soups the ingredients are governed by what is to hand or in season. It appears from early Welsh manuscripts that originally the main meat used was bacon, or even kid, for as with Irish Stew, no cottager would dream of using valuable lamb or mutton for soups. Nowdays, however, mutton or lamb best end of neck chops are most generally used, which make it into a delicious soup-stew. If in season cabbage, celery, etc., can all be used. Advice: Cawl should be started the day before so that any fat can be skimmed off and all the flavours amalgamate. Trim the meat of fat so far as possible, cover with cold water, add salt and pepper, bring to the boil, and simmer slowly for 1 hour, then leave it to get cold and skim off all the fat. Put in all the vegetables except 1 leek, the potatoes and half the parsley, cover and simmer very slowly for 1 hour, then add the potatoes cut in half and continue cooking for 20 minutes. Then add the remainder of the parsley, taste for seasoning and finely chop the remaining leek (green and white part) on top. Let it cook for not more than 5 minutes and serve. Some families treat it as a French pot-au-feu - that is, they serve the clear broth first, then the meat and vegetables as a second course. Traditionally Cawl was eaten in wooden bowls with wooden spoons so that there was no fear of burning the mouth.